The Wake Forest University Creative Writing program’s Dillon Johnston Writers Reading Series presents an evening with author John Crowley on Wednesday, September 26, at 6:30 p.m. in the Charlotte and Philip Hanes Art Gallery in Scales Fine Arts Center. The reading will be followed by a reception and a book signing. This event is open to the campus community and the public. John Crowley is the author of thirteen novels and three collections of short fiction. His first published novels were science fiction: The Deep (1975) and Beasts (1976). Engine Summer (1977) was nominated for The American Book Award; it appears in David Pringle’s authoritative 100 Best Science Fiction Novels. Little, Big (1980) won the World Fantasy Award for Best Novel; Ursula LeGuin described it as a book that “all by itself calls for a redefinition of fantasy.” In 1980 Crowley embarked on a four-volume novel called The Ægypt Cycle. This series and Little, Big were cited when Crowley received the American Academy of Arts and Letters Award for Literature. Later novels include The Translator (2002), recipient of the Premio Flaiano (Italy), Lord Byron’s Novel:The Evening Land (2005), Four Freedoms (2009), The Chemical Wedding by Christian Rosencrantz (2016), and most recently Ka: Dar Oakley in the Ruin of Ymr, published in 2017. 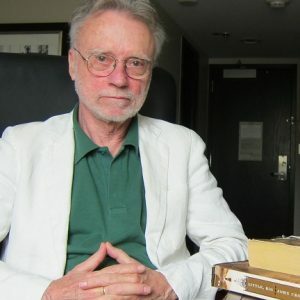 Crowley is the only author who has received both the World Fantasy Award for Lifetime Achievement as well as the American Academy of Arts and Letters Award for Literature. He has been a contributing editor for Harper’s magazine, and his essays and reviews have appeared in The Boston Review, the Yale Review, Conjunctions, Tin House, Lapham’s Quarterly, and other venues. In 2018, he retired after 24 years of teaching creative writing at Yale University.